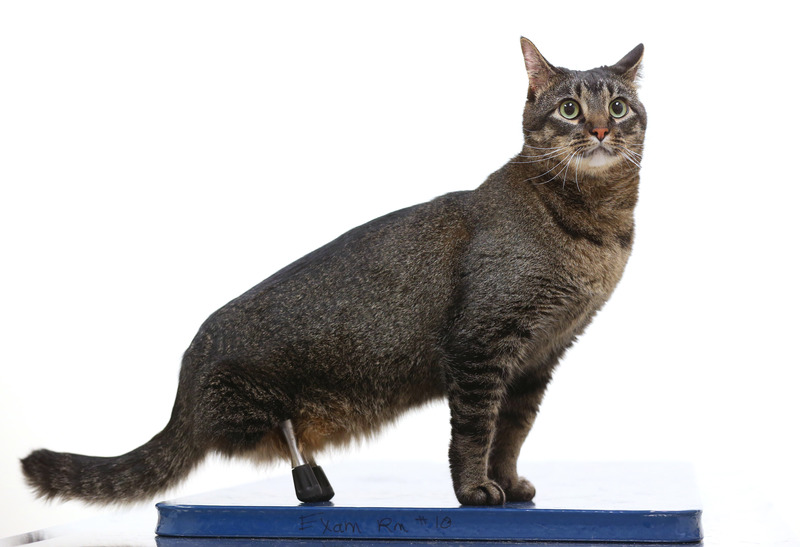 TUESDAY, Dec. 8, 2015 (HealthDay News) -- Vincent the cat's nine lives are far from over: He's recovering well after receiving high-tech hind legs that replace those lost when he was a kitten. "I anticipate that he'll be jumping and doing really normal cat things very soon," Dr. Mary Sarah Bergh, an Iowa State University veterinary orthopedic surgeon, said in a university news release. She attached Vincent's prosthetic legs and is guiding his rehabilitation. Vincent, a 3-year-old domestic shorthair, is believed to be one of only a couple dozen animals worldwide fitted with this type of artificial, titanium-alloy limb. Cindy Jones, who volunteers at the Story County Animal Shelter in the town of Nevada, Iowa, said Vincent was found at a campground. His hind legs were missing below the midway point of his shinbones, and it's still unclear what caused the abnormality. However, "I took one look at him and fell in love," Jones said. She ended up taking Vincent to Bergh for help. Bergh first tried physical therapy, but it was soon clear that "endoprosthetic" implants would work best for the cat. So, she designed implants that could be inserted into Vincent's thigh bones and pass through the skin. This enables Vincent's bone to grow onto the titanium shafts to support his weight. Vincent's first surgery took place in February 2014 and he took his first steps within a few days. He had a second operation in February 2015 and has undergone follow-up treatments to gradually lengthen his new legs. Eventually, they'll reach a normal length and Vincent should be able to walk and even jump like the average domestic cat, Bergh said. "His bone is looking great," Bergh said. "The implants are stable, and he's walking really well on them. I couldn't be happier with how he's doing at the current time." Related: Does Your Pet Need an Organ Transplant? However, Vincent remains at risk for infection because the titanium shafts are exposed to the environment, and Jones now applies an antibiotic spray to the cat's new legs twice a day. The use of such implants in animals is rare, and Bergh believes that Vincent's case may help provide important insight into the use of implants in animals. You can watch Vincent in action here.